Who said that a lower budget means fewer decorations? There are plenty of budget options in the shops, but you can also make them yourself. Create your own front door wreaths, or re-use last year’s if you have a faux one. Put some pine cones on your window sill alongside a few candles and you project an instant warmth both indoors and out. A few well-placed lights around windows and doors will lift your mood as soon as you turn them on and place your Christmas tree strategically next to the window for that all-round good feeling inside and out. Wreaths are the traditional thing to hang on your front door. Try something a little different this year by choosing, or even making one, of wood, leaves, and twigs instead invoking feelings of Christmas in a log cabin, deep in the woods. You can even supersize it, giving your visitors a huge welcome; this is also a good option if you want to keep the decorations to a minimum as it won’t swamp everything else or look like too much. If you are hanging up lights, keep them simple to keep that rustic theme going. If you have an outdoor porch or deck, you could add a rustic corner by using thick throws on seats or benches and piling up logs alongside them for the fire. A small wooden table will be the perfect spot for your mulled wine. Go all out with traditional red and green colours for your decorations and lights and keep a theme going throughout the house. Bring the scents of Christmas to your front door with some scent-infused decorations. Cinnamon, pine, and gingerbread smells will have you and your visitors thinking it’s Christmas Day already! Hang some holly around your front porch or even some mistletoe by your front door if you dare! If you have little ones (or let’s be honest, a big one who turns into a little kid once Christmas comes around), then a kids’ Christmas is a great way of watching their faces light up with excitement. 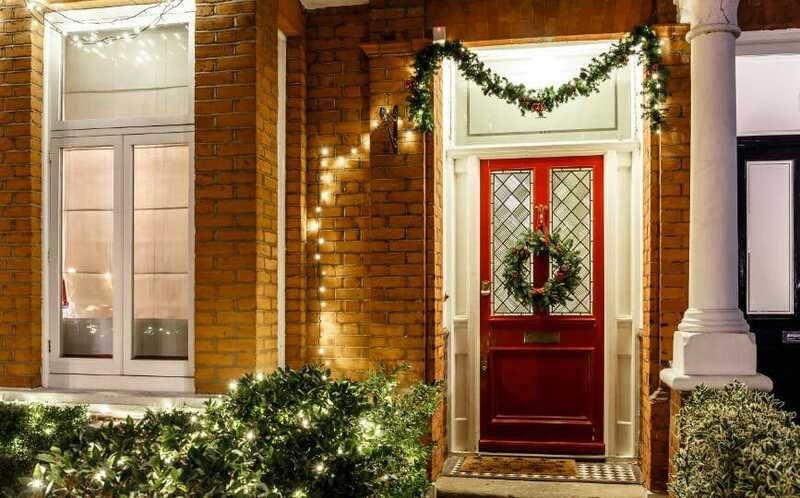 Sparkling lights around your windows and doors will brighten up the dullest day and darkest night (and light the way for Santa!) and a climbing Santa or reindeer around your home will put a smile on anyone’s face. Have a wonderful time decorating in the run up to Christmas. Remember that our team at 1st Scenic is here to offer advice and guidance on windows and doors any time of year. Just give us a call on 01689 829 600 or drop us a line at info@1stscenic.co.uk for a chat or to make an appointment. Until then, have a wonderful Christmas!